When looking to do something, you should always look at the experts who have already achieved what you want to achieve and are in the position that you want to be in. For marketers, social media has gone from being something considered just a fad, to an essential part of their marketing strategy. Today, more and more brands are realizing the true marketing potential of social media, and very few deny its powers. In fact, many of the world’s largest corporates have started using social media – and are doing it extremely well. If you aren’t yet using social media, now is the time. In this article, we’ll be listing usage stats, while also highlighting different ways that businesses are using social media for marketing to generate incredible results. Over 2.8 billion people are using social media. There’s certainly no doubt that social media for brands is no longer a fad. instead, it is equally obvious to use as having a customer service. If you look at the top brands, you will see that that all of them have gotten the basics and set up their social profiles properly. The reason why having set up your social profile is so important is because it lays the foundation to further work. Without a solid ground, you can’t start building. What’s more, your profile will be the first encounter people have with your brand on social media and we all know how important the first impression is, do we? 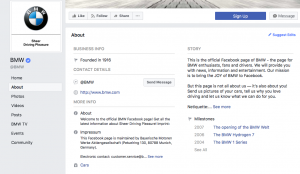 See how BMW doesn’t leave any space blank in their profile? Take this as a sign that you shouldn’t either, because they have whole departments working with marketing, and special teams only working with social media marketing in particular. I think it is safe to say that they know what they are doing. It is vital for customer retention, sparking interest in your brand, and on social media, ultimately getting them to follow you and buy from you. All social media platform’s profile setup looks different, but they do have a few things in common. First, they all have a profile picture, a bio, a link, and a username. The rest varies across the different platforms, as well as things like length of your bio, however, the rule for all social platforms -no matter which you use is that you need to complete your profile and never leave any spaces blank. This is the ultimate way to turn of people on their first encountering with you, make it seem like you don’t care, or that you’ve stopped using social media. To give a solid first impression and present yourself in the best light, start by completing and optimizing your profiles, just like the top brands have done. A very important part of your social media profile is the bio. This is a short description where you can describe your business and what it is all about, so people who are new to you know what type of brand you are and what you do. What you choose to include here all depends on your brand, and if you look on a few large brands’ bios, they are all quite different. That’s because you want to include a personal touch that reflects your brand’s values and personality. Some brands might follow the lines of being conservative and “boring”, while other brands have a personality that is edgy and fun. Quite different, right? That’s because they both operate in two completely different industries: one known to be highly conservative, and another that is known to be the opposite. As you can see, their bios are quite different and mediate completely different feelings and personalities. Therefore, there is no template you can use that will tell you exactly what to write, however, it can tell you how you should write it. Unless you are “worldwide known” and take for granted that everyone knows who you are, you need to include a description of your brand. Within a few seconds, people should be able to know exactly what you do. Include a personal touch that resonates with your target audience. That way, the people who you are trying to reach will resonate with your message and profile when they come across it and ultimately also follow you. Include a call to action, for example to your website link. In your bio, you can include your brand slogan, if you’d like. Many brands do this by including their personalized hashtag that is often their brand slogan. The reason to this is that they want to encourage people to use it, “join the movement”, and get the mo more engaged in the brand. If you want to include your slogan, it is completely up to you, however, if you have your very own personalized hashtag, it is a recommendation that you include it. When sharing content on social media, you want to have a consistent visual theme to make your content instantly recognizable, and including a logo/watermark on the posts you share helps you do that. 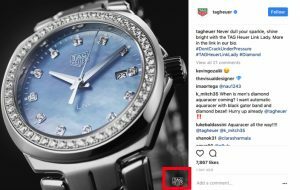 Watch brand Tag Heuer adds their logo in the corner of every single Instagram post they share. This will also prevent other people from stealing your content and taking all the credit for it. Your profile photo is a crucial part of the overall look of your profile. As a brand, your profile should be your brand’s logo, and it should be consistent across all your social platforms, partly to make it easier for people to find you, and partly because you want to increase brand and logo awareness. This is something that almost all major brands have in common. Just take a look at Porche, Snickers, H&M, and IKEA. They ll have their brand’s logos set as profile pictures. On different social platforms, you can add a different number of links, but what they all have in common is that they all allow you to include at least one link in your profile, clearly visible when people are visiting your page. This will allow you to easily drive traffic and give people who are interested in learning more about your business a quick way to do so. Different brands have different objectives with their social media usage, but what is most important is that your actions reflect your strategy and goals. Of course, these are just things that the brands hope to achieve with social media (which social media allows them to do), but their main objective is beyond the things listed here. If you’re using social media, you probably wouldn’t say that your goal is to “showcase your products”, right? The real reason is extracted by asking why you want to showcase your products. If this would be the case, your answer might be that you want to increase sales, and the same principle of extracting information can be done for the large brands as well. What would you guess Sprite’s main objective with social media is, just by looking at this video? To showcase their brand’s personality of course! And if you ask the question “why?” as I mentioned above, you can draw the conclusion that they want to resonate better with their audience, which ultimately allows them to build better relationships and draw their audience closer to them, and lastly, bridge the gap between brand and audience. FedEx regularly share user-generated content on their social media, and this is a strategy that they’re not alone on using. First off, by sharing content from your audience, you show that you value them and that you acknowledge them. This will make them more loyal to your brand, and continue to post content about your brand and products – leading to free marketing for you. Second, by showing other people that you are reposting content from your followers, you’ll encourage more people to do it, and ultimately, you’ll gain even more exposure. What’s more, the statistics speak very clearly about the benefits of sharing UGC on social media. 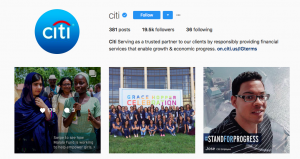 Another trick that a lot of the major brands are using is to put great emphasis in color and making it consistent all across their profiles and posts. 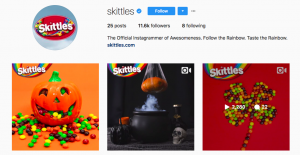 Many of the largest companies know what colors work for them, and most importantly what color they want their audience to associate their brand with, and will, as a result, think about how they use colors social media. Coca-Cola wants you to associate the color red with their brand, and they’re investing tons of resources into making that a reality. And to quite an extent, you might even say that they’ve succeeded. If I ask you to think about red and then mention a brand that has that color, chances are, you might say Coca-Cola. 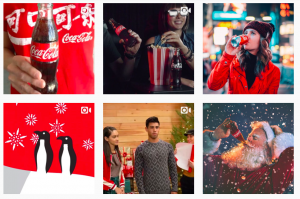 Coca-Cola does an incredible job at keeping a consistent visual theme when it comes to color scheme on social media, and if you look at all their social media platforms, as well as their social media posts, it’s clear that they’re trying to incorporate the color in one way or another – and do it consistently. Dell is using social media to show (and tell) stories on how their customers are using their products, and how their products have a huge impact on how their customers live out life. Not only is storytelling extremely effective in marketing, it also helps impact their audience more deeply. Which is your favorite brand on social media? What are they doing well? Which brand do you think is doing the best job on social media?